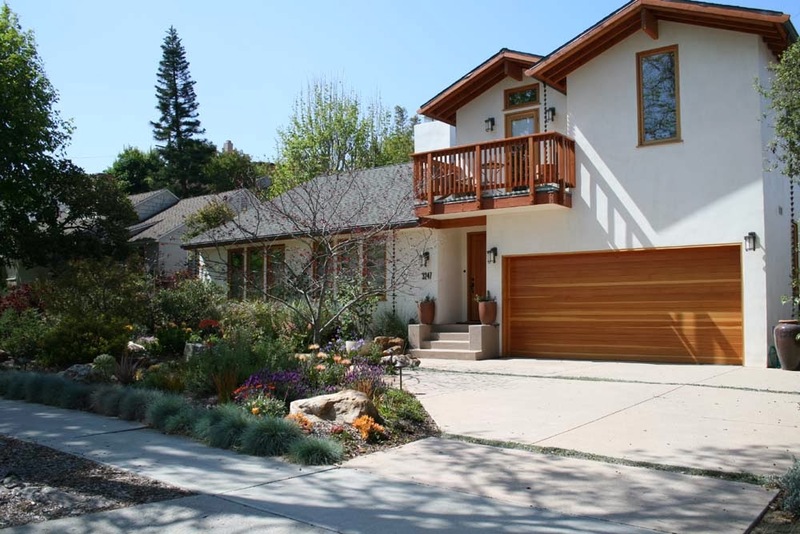 These homeowners wanted to convert the property from water guzzling, high maintenance turf - boring monoculture - to a combination of plants that would save water and maintenance hours and provide visual beauty while serving the habitat needs of the local fauna of birds, bees and butterflies. When they bought their house, the front garden was a sea of grass struggling to remain green and 8 shrubs sheared into muffin balls - really unimaginative and un-California. They met Susanne Jett who created a gorgeous native garden that has gotten more beautiful in the nine years since she planted it. They were so happy with it that, after remodeling in 2010, they had her return to do the backyard. Now their entire landscape is environmentally friendly and they couldn’t be happier with how it looks. They asked her to plant with butterflies and hummingbirds in mind. They enjoy visits from both. The garden refurbish of 2010 now includes a rainwater catchment element (infiltration pit) in the front yard and rain chains on all of the gutters throughout the property. The infiltration pit collects roof rainwater runoff from the front half of the house. During a normal rain season, thousands of gallons of rainwater are diverted from the street gutter into the ground water table of the site. All walking and driving surfaces on the property are designed to reduce water runoff to the street. 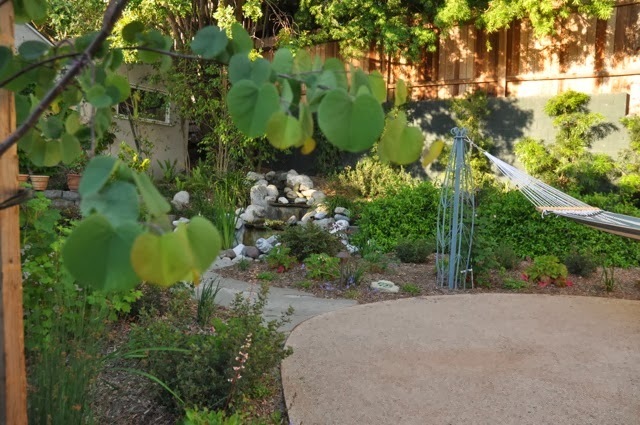 The front garden is a combination of plantings and permeable walking areas from the original landscape installation of 2004 and the post-remodel refurbish plantings of 2010. 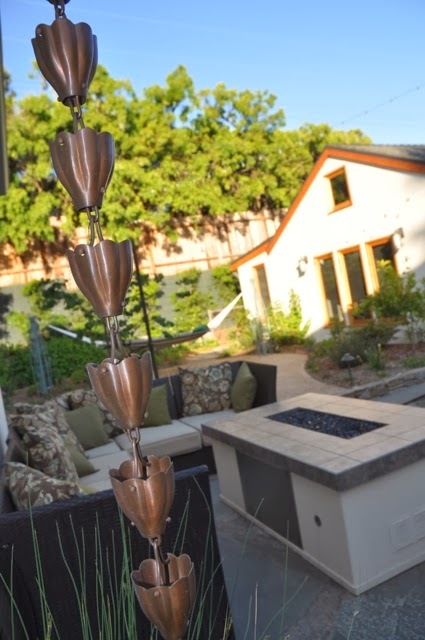 The back garden was completely re-landscaped as part of the 2010 remodel. The entire landscape is a combination of Mediterranean plants and many California natives. The homeowners also enjoy food from the edible garden bed and the fruit trees. With the exception of the edible plants and trees, all plants in both gardens are low to medium water need. Most of the plants provide some type of habitat support in fruit or seed and attract beneficial insects to provide integrated pest management in the garden without chemicals. All planting areas on the property are serviced by low-volume, drip irrigation. The delivery of irrigation ranges from every day for the leafy edibles to once a week or every other week for the low water need plants. Transitioning from a turf dominated landscape to one of low and low medium water use plants and efficient low-volume drip irrigation can reduce landscape water use by 65% to 85%. Landscaper Susanne Jett as well as Mimeos Solar will be at the garden to answer your questions.